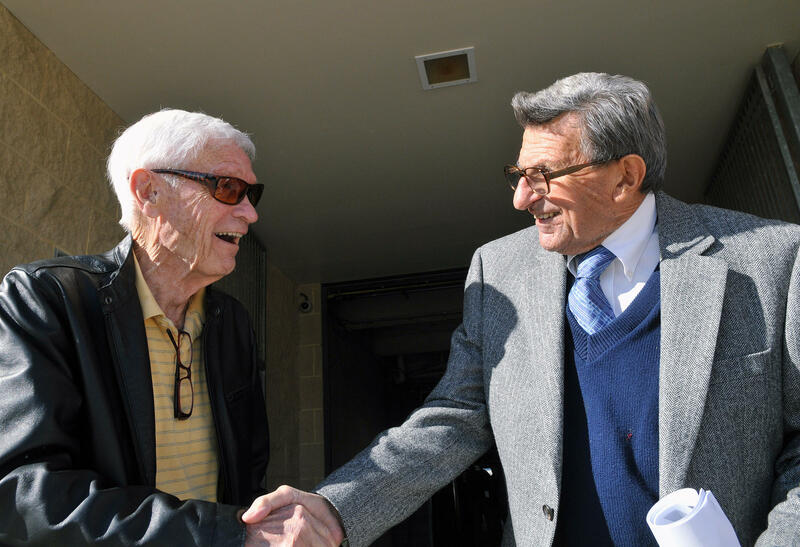 Fran Fisher, left, congratulates Penn State coach Joe Paterno, on his 400th career coaching win after his weekly NCAA college football news conference on Tuesday, Nov 9, 2010 in State College, PA. Fisher was the Penn State football play-by-play announcer until his retirement in 1999. Penn State broadcaster Fran Fisher passed away this morning at the age of 91. Fisher had been involved with Penn State Athletics since 1966. He served as Penn State Football Radio Network’s color commentator until 1970, when he took over as the play-by-play announcer. Fisher left radio in 1983, but continued to hold many positions at Penn State, including Assistant Athletics Director. He also lead the team that developed the current Penn State logo. Fisher's son, Jerry Fisher, posted this tweet after his father's passing. I lost my hero, mentor and the greatest man I have ever known this morning! Rest in peace Pop, the true Mr. Penn State.